The symbol opposite is placed on a well known ‘wild berry’ soft drink. 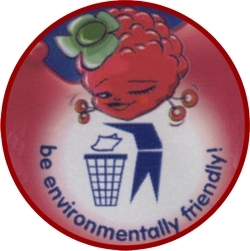 The package designers have been inventive and they have combined a ‘be environmentally friendly’ symbol with the head of a character shaped like a ‘berry’. 1b. Explain your answer to 1a. 2. The manufacturer of a sports / energy drink want you to combine their image (DIA. A) with the ‘be environmentally friendly’ symbol (DIA. B). The symbol and the image are seen below. In the space opposite, draw your design ensuring that it still represents the ‘be environmentally friendly’ symbol (also known as the ‘Keep Britain Tidy symbol). 3. In the space below, design two of your own symbols to represent recycling. They should be simple and easy to understand. Consider the colour scheme carefully.